Powerpoint Engineering Ltd are specialists in the supply of Thermal Imaging Equipment in Ireland. This equipment includes thermal imagers, infrared (IR) cameras, thermal imaging windows & accessories. We can also offer complete, comprehensive Thermal Imaging Surveys, which allow clients to instantly verify thermal performance of buildings or industrial equipment. We offer a wide range of Thermal Imaging Training Courses. These regularly scheduled courses range from 1 Day ‘Introduction to Thermography’, our 4 Day Certified ‘Level 1 Thermal Imaging’ and our 4-Day Certified ‘Level 2 Infrared Thermography’. The response from the course attendees has been very positive. You can click here to see a sample of our Client Testimonials from our 1 Day Training course. Level 2 Certification on both electrical and building applications can be arranged where required. Contact us for further information. Powerpoint Engineering Ltd are a fully Registered Training Provider as awarded by Engineers Ireland for 2019. We are also fully registered with Achilles as a Level 3 Supplier. We also offer an in-house Calibration & Repair Service for all leading thermal imaging cameras to ISO9001:2015 standards. Thermal imaging or thermography describes the way in which the human eye can see the infrared end of the spectrum. Thermal imaging technology (in the form of a thermal imaging camera) is used in applications such as renewable energies, building diagnostics, energy audits or home inspections, facility management and restoration jobs. How does a thermal imaging camera work? A thermal imaging camera (also known as an infrared camera, thermal imager or IR camera) works by producing thermal or heat pictures of equipment. It contains a very special lens, capable of focussing infrared light emitted by the objects in the thermal imaging camera’s line of view. This focused light is turned into a thermogram, which is a detailed temperature pattern. The thermogram is then translated into electric impulses, which in turn converts the impulses into data for the display on the thermal imager. The data is represented as various colours, depending on the infrared emission intensity. A thermal imaging survey includes the capture of thermal images of electrical distribution equipment through the use of a thermography camera. These images are then analysed to clearly identify faults which can potentially cause equipment failure and property damage. A report is produced which identifies the equipment surveyed along with details of any faults discovered. Users take thermal images of key units at set intervals, and compare those images at each visit. Any new “hot spots” indicate problems that can now be investigated before they result in failure. Thermal Imaging Surveys are non-intrusive, enabling inspections to be completed safely and efficiently, without interruption to your business operations. 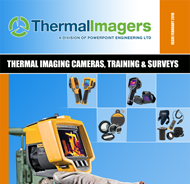 Book your Thermal Imaging Survey today. Contact us now to discuss your exact requirements. Or give us a call on 057 866 2162 to speak to our highly skilled engineering team. Please do not dispose of waste electrical and electronic equipment (WEEE) as unsorted municipal waste, this should be collected and disposed of separately. Powerpoint Engineering can dispose of this equipment for you, please contact us at [email protected] or 057 866 2162.